Is your child due to attend school soon? Or perhaps it is already in first grade? School is where children first experience power struggles and squabbling with their peers and school friends. Do you know how your child will react to these situations? Are they a ‘victim’ or are they able to assert themselves and have a true idea of personal safety? Is your child into any sport or have a meaningful hobby? 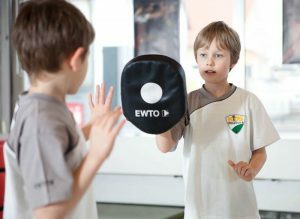 Kids WingTsun teaches children all of these aspects and at the same time offers them a chance to embark on a meaningful leisure activity. School of movement and confidence: The main focus is on self confidence and a form of self defence that is appropriate for children and situations they may face on a day-to-day basis. Approach to adults and peers: Helping to develop their ability to foresee dangers, and teaching children important rules of behavior and preparing them for a number of scenarios through training. The aim: To help young people become upstanding and strong-minded individuals – who also have a lot of fun. All in all: Children shall learn in a playful way to find their orientation in this world, to position themselves well and be able to help themselves and others in difficult situations.